Who Brought the Luck to the Lucky Country? From retail property mogul Frank Lowy to recruitment queen Sarina Russo, Who Brought the Luck to the Lucky Country? 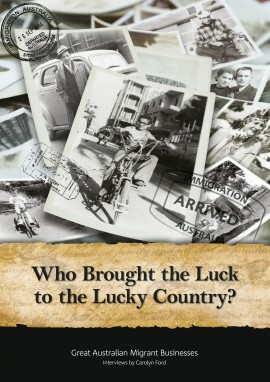 celebrates the people behind so many of Australia’s successful migrant businesses and shares their personal journeys. The inspiring stories contained within this book provide a fascinating insight into the entrepreneurial spirit of these men and women. There is a common theme – while luck may have brought them to Australia, it’s talent, determination and sheer hard work that has led to their success. A veritable compendium showcasing those who made Australia into the cultural melting pot it is today.